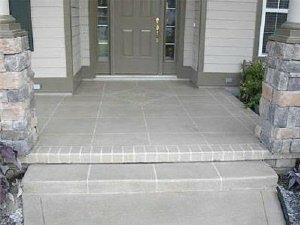 Decorative concrete porch steps can be part of a terrific looking front entry to your home. Whether it's a small landing or an oversized patio with room for seating, the concrete porch can be highly visible and an important design element. 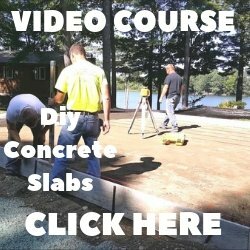 Here are some design options for great looking concrete porches, steps, and landings. 1. Having a stamped concrete porch with matching steps makes for a great combination. Having the same color and pattern for both blends the look and creates a smooth transition to your front entry. 2. If you have old, worn concrete porch stairs that are in good condition you can give them a face lift with a decorative concrete overlay. A concrete overlay can be colored and stamped or acid stained to create a highly decorative look. 3. 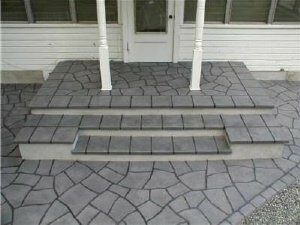 Engraving your concrete porch and coloring with an acid stain is another option that will create a decorative look to plain gray cement porch steps. Concrete engraving can be used to create many patterns like stone, brick, or tile. 4. 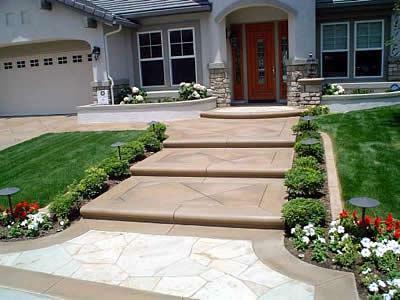 Stenciled concrete can be used for old or new cement porch steps and landings. Stencils come in many patterns that will match the look and feel of your home. Mimicking brick with a stencil is a popular pattern for many homeowners. 5. 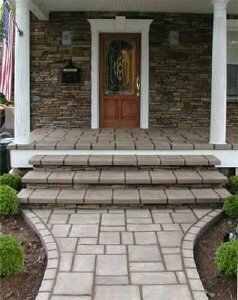 Decorative cement porch steps that match an adjoining front stamped concrete sidewalk will complement and add to the appeal of a homes exterior. 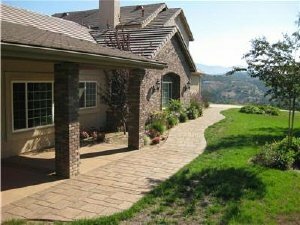 If your concrete porch and steps are starting to delaminate and spall, they may be a candidate for concrete resurfacing. 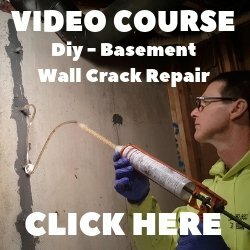 Repairing the concrete and resurfacing it with a concrete overlay will enable you to give your front porch a facelift with one of the methods described above. 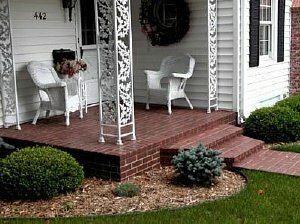 If you want to make a great first impression with friends, visitors, and passersby, try using decorative concrete to dress up an old or new front concrete porch and steps. Click on PREFAB CONCRETE STEPS to learn about the advantages of precast concrete stairs.